Next week’s Working Waterfront Festival will cap a summer of events presenting Ernestina-Morrissey to old friends and new. Volunteers are vital to the return of Ernestina-Morrissey, Join the CREW! Although our favorite ship, Ernestina-Morrissey will not be in her usual berth for the Working Waterfront Festival it is important that we reach out to everyone to explain the exciting news of her reconstruction and bright future. I hope you will help out in the booth for a couple of hours Saturday or Sunday. The hours are 11 am – 6 pm on Saturday, September 26 and 11 am to 5 pm on Sunday, September 27. It is a great festival with music and demonstrations and contests. Take a look at the festival schedule and CONTACT US let us know when you can help. An added bonus at the Festival will be the appearance of Chet Brigham for an author signing of his new book Phoenix of the Seas . on Saturday 9/26 at 2:30. Stop by, learn some new things about Ernestina-Morrissey’s history, and pick up your copy of the book for yourself. 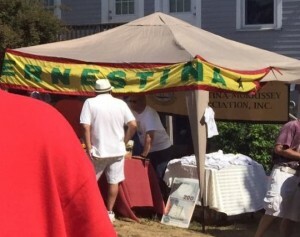 SEMA President Julius Britto brought the latest news to the Onset Cape Verdean Festival. 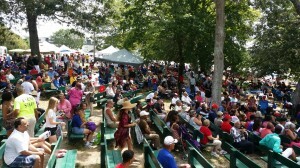 Thousands attend the Festival to reconnect with friends and enjoy a beautiful summer day. Julius and other volunteers shared the latest news. the The Cape Verdean Association in New Bedford, Inc. hosted Schooner Ernestina Commission Chair, Laura Pires-Hester at the The Cape Verdean Cultural Center. Dr. Laura Pires-Hester, Chairperson of MA Schooner Ernestina Commission and Alves Medeiros, Chief of Staff for MA state representative Antonio Cabral at recent "What's Up With Ernestina?" 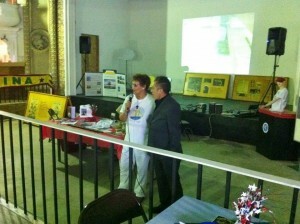 Open House held at Cape Verdean Association of New Bedford Cultural Center. On the summer afternoon of Saturday, August 22, 2015, several members of the community gathered to hear the most recent updates about the historic and unique Schooner Ernestina-Morrissey at the Cape Verdean Association Cultural Center in New Bedford, MA. MA Schooner Ernestina Commission Chairperson Dr. Laura Pires-Hester said thanked the CVANB President Raquel Dias and Officers for opening their space for this community gathering, especially Officer Scott Lima. She said that it was a most appropriate venue since “both the Schooner and the Cultural Center are currently undergoing restoration, and both are being done with careful planning and broad support….” In addition to the sharing of information, answering of questions, and urging continued support by Dr. Pires-Hester and Commissioner Gene Monteiro, and SEMA (Schooner Ernestina-Morrissey Association) President Julius Britto, the group was also addressed by Alves Medeiros, Chief of Staff for MA State Representative Antonio Cabral. Representative Cabral is a longtime supporter and advocate for the Schooner, and Mr. Medeiros enthusiastically shared their constant message to make sure that the people of the Commonwealth of MA understand that Ernestina-Morrissey is the Flagship for the whole state, not just New Bedford or for the Southeast. He committed their full support going forward and urged everyone to continue to demonstrate their concerns and financial support for the vessel’s restoration and her new future. 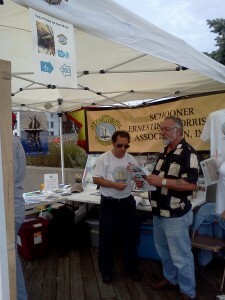 The Schooner Ernestina Commission and Schooner Ernestina-Morrissey Association are grateful for the cooperation and co-sponsorship of the CVANB, the Office of Representative Antonio Cabral, the Old Bedford Village Development Corp, the Whaling Historical National Park, the New Bedford Historical Society, and Tony Neves Travel. Thanks and appreciation also go to John Pires, Jr., Frank Grace, and Mary Pires Grace for their providing “manchupa/katchupa”, “gufongo”, and cakes; and for the several other volunteers who joined in. The next meeting of the Schooner Ernestina Commission will be held on Monday, October 5, 2015, 1-3pm, at the National Park Service; the public is invited. By Laura Pires-Hester, Ph. 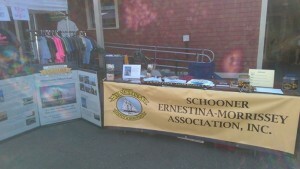 D.
SEMA Director Polly Zajac represented Ernestina-Morrissey at the Gloucester Maritime Heritage Day of the Annual Schooner Festival. As usual many friends stopped by for the latest news. And Chet Brigham was there for part of the afternoon discussing his new book, Phoenix of the Seas. It was a great weekend with a record number of schooners competing in the races. The new schooner Columbia had everyone talking with her first place finish. If the link to the Columbia video doesn’t work try the Ernestina-Morrissey Facebook page, it is posted there. 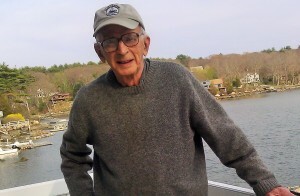 Commissioner Fred Sterner and SEMA Secretary Mary Anne McQuillan visited Boothbay Harbor. There are new photos posted on in the Flickr Album. Finally SEMA is working to raise the $1 million we have pledged toward the reconstruction project. There will be more news soon or you can DONATE TODAY! This entry was posted in Commission, Fundraising Committee, Maintenance and Operations Committee, Membership and Outreach Committee, News. Bookmark the permalink.